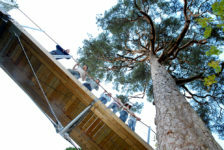 The project was for a unique 250m long Tree Top Walkway along the Lough shore. A visually beautiful and contemporary structure existing in harmony with the trees in which it nestles, the Tree Canopy Walk is also the first of its kind in Ireland, this unique viewing walkway meanders through the treetops, and commands unparalleled views. The tree canopy walk forms part of the ‘Lough Key Experience’ – an audio self-guided trail combining the 19th century underground servant tunnels and the refurbished 5-storey Moylurg Viewing Tower from which the expanse of the entire park can be seen. 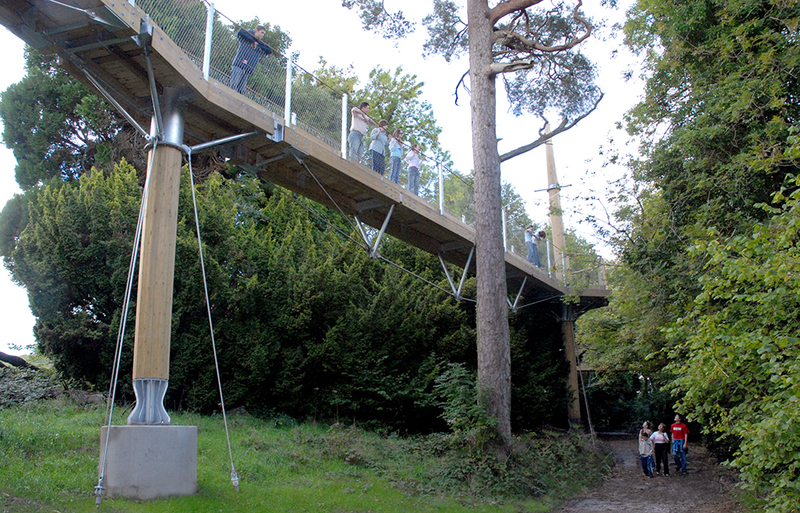 This is a 1.2m wide walkway designed, in keeping with the Client’s wishes for disability access throughout the park, such that wheelchair users can easily move along the bridge with maximum deck slopes of 1:20, rising in places to 6.5m into the tree canopy. The main features of the bridge are 20m span Glulam timber bridge beams ‘reinforced’ with under-deck stainless steel bowstrings. 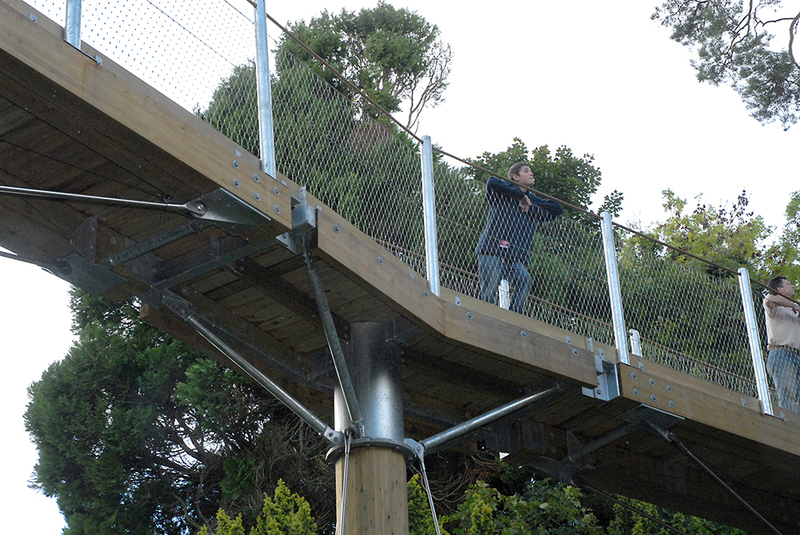 500mm diameter hollow Glulam sway-masts are located at 40m intervals, extending up to 16.5m above ground level, each with structural-steel/timber ‘crow’s nest’ viewing platform. A 500mm diameter hollow Glulam post, positioned mid-way between each sway-mast extends from ground level to the underside of the deck for intermediate support. ‘Semi-harp’ stainless steel suspension tendons extend from the top of the masts to either side of each adjacent bridge section at mid-span. The sway-masts and posts are on mini-pile foundations and stainless steel tendon guys connect to ground anchors at selected masts and posts. The walkway was almost exclusively hand built. The route taken by the tree top walkway was selected with the intention of minimising the impact on the local wildlife and fauna whilst allowing the public to gain access to and enjoy the diversity of the forest park from a unique vantage point. In order to select a route through the forest required the interaction and commitment interaction of all the Key Stakeholders including Lagan, Scott Wilson, Roscommon County Council and Coillte (public authority). The aim was to choose a route that passed as close as possible to the trees whilst seeking to trim or cut down as few trees as possible This was successfully achieved. Minister Mary Coughlan commended the “collaborative” and “environmentally sensitive manner” in which the development of Lough Key was undertaken. Design Associate for Scott Wilson, Richard Nicholl commented that this project was “one of the best collaborative projects I have been involved in”. Civil & Landscape works included the refurbishment of two existing masonry arch tunnels, 120m and 80m long with lighting for improved public/disabled access, and the redevelopment of the mansion (destroyed by fire in the late 1950s) as a sunken garden. A new sewage pumping station and 3Km of twin pumping mains through the park, connecting to the county sewer was installed to facilitate the construction of a visitor centre. There were also extensive concrete repair and demolition works to the Moylurg Tower a reinforced concrete six storey viewing tower built in the 1960s on a prominent hill top. Works also included a €500K adventure playground, revised roads, new pathways and planting.